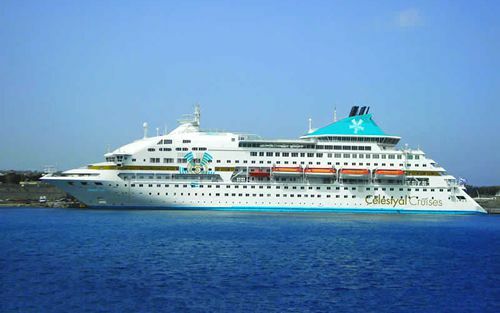 The Celestyal Crystal offers a 7 night “Idyllic” itinerary which provides the ultimate Greek island hopping experience. 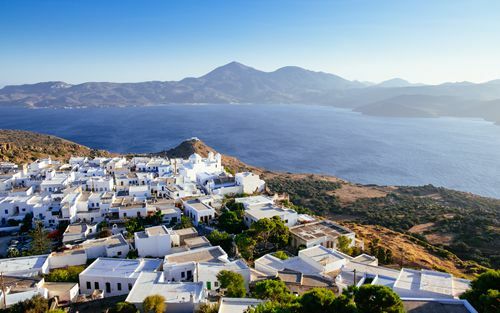 With these itineraries you will not only get to experience some of Greece’s better known islands such as Crete, Mykonos and Santorini, but you will also get the opportunity to visit lesser known yet equally charming islands such as Samos, Milos and Syros to name a few. 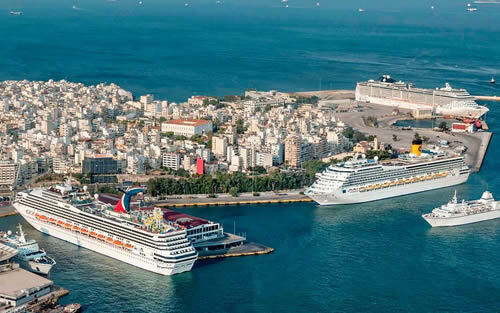 There are plenty of itineraries to choose from to ensure you visit the places you desire and your Aegean cruise will be made memorable by the comfortable Celestyal Crystal, complete with its 2 pools, casino and wellness centre. Note: * It may be necessary to amend the itinerary due to prevailing local circumstances. We will endeavour to provide you with as much notice as possible. As so many sites are visited, this cruise may not be suitable for the very elderly, people with walking difficulties or children. Please note that some excursions may take place very early in the morning. Optional excursions shown may be available to pre-book, and where a tour is capacity controlled and participants are limited it may be advisable to do so. All tours/activities/excursions are operated by local, independent suppliers and your contract will not be with us, but with them, subject to their terms and conditions. 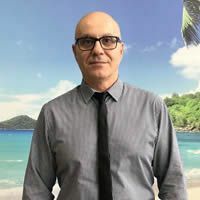 When booked locally we are not responsible for the availability, operation, or any risks that may be involved with these tours/activities/excursions. Embarkation at Piraeus port in Athens throughout the day. Enjoy free time to familiarise yourself with the ship. Depart from Athens in the evening at 21:00. Early morning arrival in Mykonos where the boat will be docked for the entire day, giving you the chance to explore the magic of Mykonos island and take optional excursions. Overnight in Mykonos. 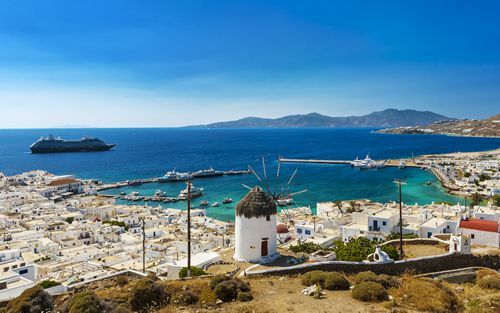 Depart Mykonos at 07:00, spending half a day a sea and arriving at the island of Milos at 13:00. Spend the rest of the day and evening enjoying this under the radar island before departing at midnight. 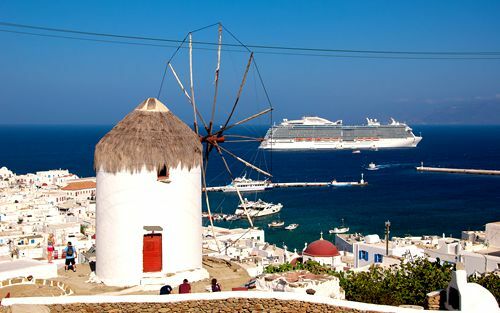 Arrival in Santorini at 08:00 and enjoy the entire day on this island at your leisure. 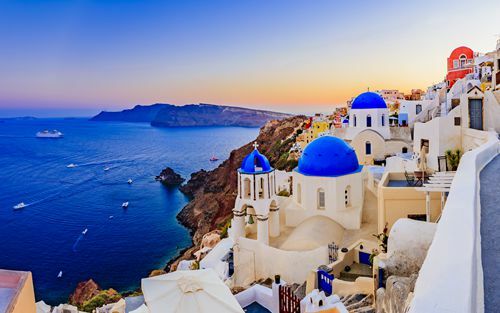 Take the included excursion to the village of Oia. Overnight in Santorini. 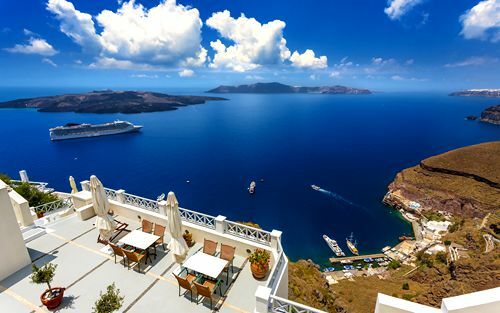 You have another full day to enjoy one of the most romantic places on earth, Santorini. Departure from Santorini at 23:00. Early morning arrival in Heraklion, Crete. 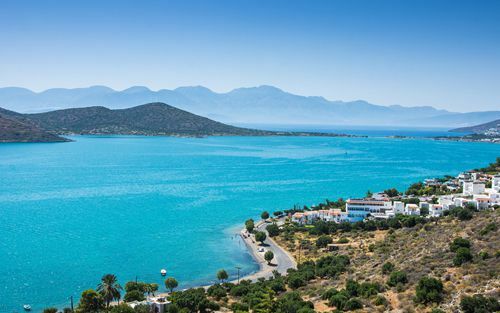 Enjoy the whole day on this island and take the included half-day excursion to the Minoan Palace of Knossos. Depart Crete at 20:30. Arrival in Kusadasi at 11:30. 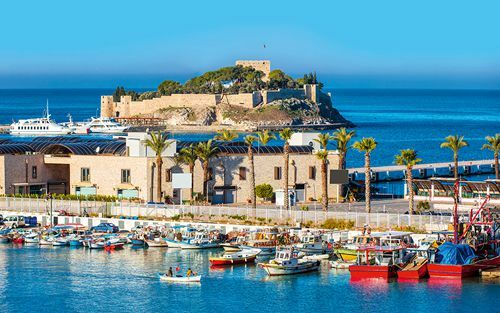 Take the included half-day excursion ‘Ancient Ephesus through the ages’ or enjoy Kusadasi at your leisure. Departure at 17:00. Arrive back in Athens at 09:00. Take breakfast on-board before disembarkation. Transfer to the airport or to a hotel of your choice for an extended stay. 480 cabins all with en suite bathrooms, air conditioning, TV and radio. “Blue All Inclusive” and “Non-Alcoholic” drinks packages available.